Add all ingredients for the patties to a bowl and mix together until combined. Shape the mixture into 16 patties and place them on a sheet pan lined with parchment paper. Bake for 20 minutes. Heat the olive oil in a saucepan over high heat. Add green onions and garlic and sauté for about five minutes or until soft. Add ginger and sauté for 30 seconds, and then add chicken broth. Bring the mixture to a simmer and add coconut milk, lime juice, fish sauce, and garlic powder. Let ingredients simmer for 10 minutes. In a small bowl, whisk the cornstarch together with 2 Tbsp. of water, and then pour the mixture into the saucepan. Let the ingredients come to a boil and thicken. Add salt to taste. To assemble, place one patty on each whole-wheat bun and top with 1-2 teaspoons of the sauce. It’s all good! 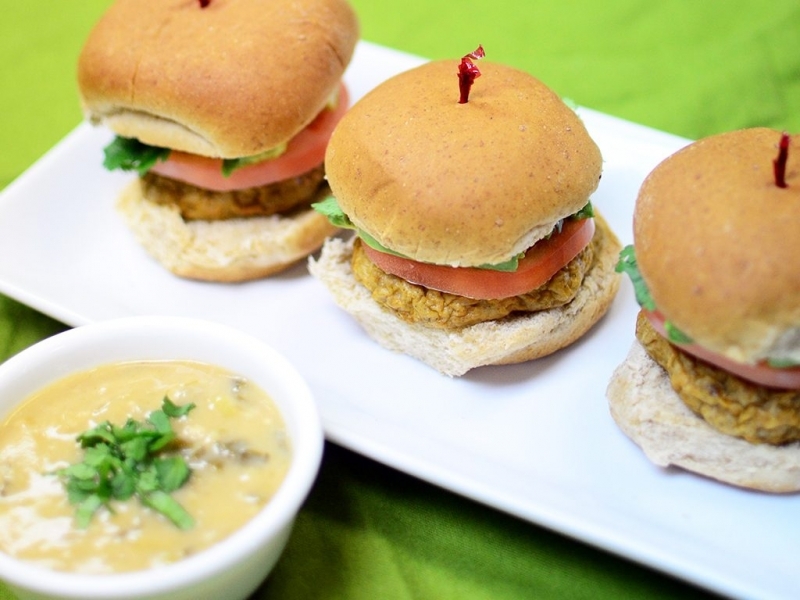 These chicken sliders combine fresh veggies, lean protein, and whole grains for a light and nutritious meal. We recommend topping them with cucumbers, shredded carrots, cilantro, and avocado for a variety of colors and nutrients.